Make your home as safe as houses thanks to the security specialists at Advance Security. With over 20 years of on-the-job experience behind us we have gained extensive hands-on knowledge and training to make sure that your home environment is afforded the highest standard of safety and security. As one of Melbourne’s leading security companies we have earned a reputation for installing effective and modern security solutions to help prevent break ins and deter would-be thieves from entering your home. Covering all steps of the process from the initial consultation through to the final installation our helpful, friendly, and professional team will give you increased confidence in the safety and security of the home you live in. At Advance Security we stock only the best and widest range of security products and systems to ensure that we deliver a complete security experience to our valued customers living throughout Melbourne. 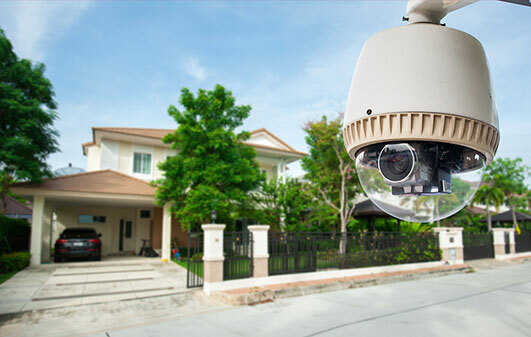 Perfect for installation in single homes, townhouses, and apartment complexes we can install CCTV cameras at strategic locations, closed systems for access control, and sensitive alarm systems that activate once the perimeter has been breached. No matter your particular security needs and requirements Advance Security is the team for you. Once installed and operational our effective security systems can increase the value of your home both financially and in the way they deliver lasting peace of mind. To speak to a member of our expert team about updating your property’s security solutions call us today on 03 9735 2000. With Advance Security my home has never been safer. Instead of running around at the slightest sound outside my bedroom I just look at my smartphone and I can see through the cameras installed around my home. I was sick and tired of having vandals constantly wreck the front of my store. Since Advance Security installed their CCTV cameras and alarms the damage to my shop has stopped. Thanks Advance! Before I spoke to Advance Security I had no idea that security systems could be so advance. I now sleep soundly knowing that my home is protected from trespassers. I was amazed at the ideas and advice that Advance Security’s team gave me regarding my office’s security. Thanks to their professionalism and affordable pricing I now have complete control over who has access to my business. Highly recommended. The team at Advance Security took the time to meet with me and make me feel valued. They gave me detailed options to consider after my home was broken in to. Since they completed their installation works no one’s tried to break in. Advance Security dealt with my needs directly. Their hands-on approach has helped my workplace stay secure and free from intrusion. I cannot recommend Advance Security more if you want the best security money can buy. I wasn’t home when the alarm went off, but Advance Security were monitoring the alarm signal and sent a response team to check it. Luckily it was a false alarm but knowing Advance Security were there gave me tonnes of confidence. The perfect deterrent to crooks and thieves. I am happy to leave my home now without worrying anymore. Advance Security’s approach has given me the confidence in my home’s security.